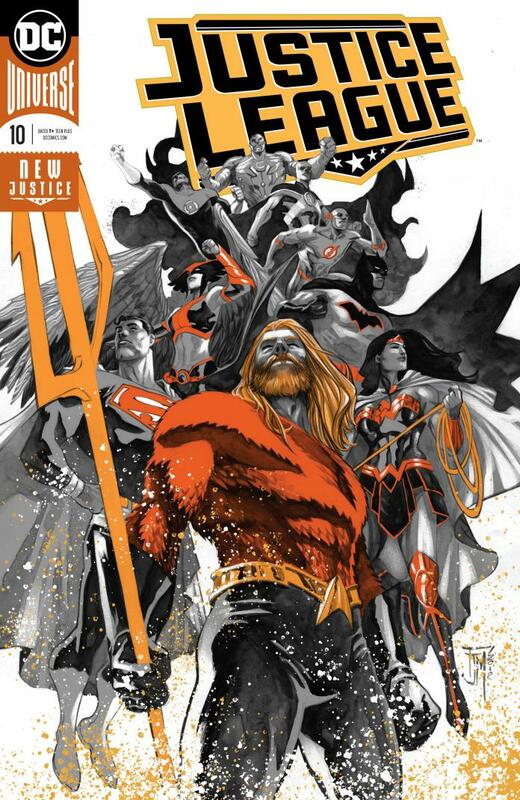 Justice League #10 is the beginning of the Drowned Earth storyline. Although written by Scott Snyder this storyline is basically setting up the new status quo of Kelly Sue DeConnick’s upcoming Aquaman. The story also does set-up the future of what is happening to the Justice League. As I have said before about Snyder’s Justice League, he is never afraid to split up the team into smaller teams, and have each team tackle something different, as opposed to always using the whole roster at all times, and so far, I think that may be for the better. The main story focuses on Aquaman, Wonder Woman and Firestorm as they search for the body of Poseidon. They end up discovering a really old ship that belonged to an Atlantean hero called Arion, who made a conch to call sea-based creatures from other worlds. They then discover a key which unearths a sea monster that attacks them. Firestorm is taken out and becomes a monster whilst Aquaman and Wonder Woman are swallowed by the monster. We don’t find out what happens to Wonder Woman, however Aquaman meets the off-world sea-based creatures Arion first called, however these creatures turn out to be invaders that came when Arion originally called the off-world creatures.